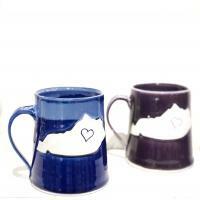 This is the perfect mug for the Kentucky lover in your life! Every mug is unique, but hold 10-12 ounces of liquid comfortably. Only food safe glazes are used in these mugs. They are also dishwasher & microwave safe! Top shelf in the dishwasher is recommended for longevity. This mug is available in a rich cobalt blue or a deep purple - please specify in the comments section of your order which color you'd like if you have a preference.